The Garden of Love © Stephanie Jucker, mixed media on panel, 16" x 16". “Things in the garden are making me nervous. To quote William Blake’s poem Garden of Love, I am seeing ‘what I never had seen.’ My use of garden as a metaphor is partly influenced by the iconography of a Catholic upbringing, with its portrayals of Eden, and a nostalgia for the English garden I played in as a child. I revisit that sense of play in my work, but from a place of experience. My response to feeling anxious has been to recycle materials that accumulate around me. With burnt, water-damaged, and discarded stuff, I construct symmetrically balanced compositions to reassure and ground myself. The design is informed by the geometry of insects and flowers resulting in wall pieces, books, and mobiles compositionally anchored by a central axis. From this secure core they burst with life, referencing the giddy optimism of creation in the face of a tenuous future. 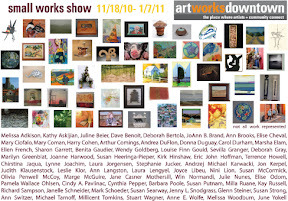 The Small Works Exhibition is a wonderful opportunity to find unique, quality artwork for the holiday gift-giving season. The exhibition takes its name from the phonetical transcription of the word "care." The term "care" is a shifting concept that variates its meaning in opposite directions according to where is placed in a sentence. The concept swings from burden and comfort as a concern, as well as the ability to feel that something matters, to be cherished. For Martin Heidegger (1889-1976) this concept was the epicenter of his philosophical system of thinking. He employed the word at an abstract, ontological level to illustrate the basic structure of the human being. Considering this concept, curators Sergio de La Torre and Fernanda Partida Ochoa bring together the work of five Bay Area-based artists: Jose Joaquin Figueroa, Alexander Hernandez, Marcela Pardo Ariza, and Jessica Sabogal. The selection of artworks in the exhibition traverses different moments in each artist’s practice. Its common thread, what each artist cares for, emerges in a variety of disciplines. /ker/ at Art Works Downtown illustrates the abstract notion of "care" in its broad range of interpretation. That said, having a concept to start with, isn’t always such a bad idea. Because we do care, do you? Curators Theodora Mauro and Tracy Wheeler focus on the mystery of how nothing becomes something in the art making process, balancing in part on an artist’s ability to veer from an original concept towards what’s calling to be made. Windy Chien, Sydney Cohen, Randy Colosky, Amos Goldbaum, Mary Anne Kluth, Patricia Lyons Stroud passionately embrace the vertigo of not knowing in order to make work that teaches them, piece by piece, about what they’re after. Chien considers how to create a line that asks one to contemplate control. Cohen lives to impart a deep wisdom about color. Colosky explores the tension inherent in our cultural expectations of particular materials. Goldbaum digs into how human endeavor impacts purpose and place. Kluth investigates the nature of reality in the context of landscapes. Stroud makes a plea for softness and touch. Taken together, the work in Veer featured at Art Works Downtown in San Rafael, offers evidence that allowing oneself to move abruptly away from preconceived goals and expectations can lead to glorious new directions. That said, having an idea to start with, isn’t always such a bad idea. Theodora Mauro co-directs the alternative gallery space SATELLITE OF. LOVE, is director of ampersand international arts, and is a San Francisco native supporting artists, local and international, emerging and mid-career, with platforms for communication and exhibitions that are open, unique and inspirational. Tracy Wheeler co-directs the alternative gallery space SATELLITE OF. LOVE, is a regular curator at ampersand international arts, and is a strategic consultant for artists and cultural spaces or initiatives. Images—L–R: Council of Twelve © Heather McFarlin; Treading Light-Stream Step © William Binzen; ...And Then It Shattered © Gil Sambrano; Chic © James Lammers; Auntie Mae's Sewing Basket © Claudia Tarantino; And Her Mother Is Worse Than None © Eric Kelly; He Left Without His Shoes © Katy Drury Anderson; Forgiveness is a Warrior © Jen Solomon; Prelude to a Blind Canon Ball © Paul Goldman; Juxtaposed © Mary DeShaw;The Bridge © Karen Robinson; Showtime© Vaidis Valaitis. The theme for this exhibition was inspired by conversations about the blurring of the line between what we consider natural, and what we consider unnatural. There is a rich history of artists working in nature and with scientific research specimens to render animals, insects and plants in all of their diverse splendor. Let’s call this the natural. We are also at a point in time where nature is inseparable from human influence–we have entered the geographic footprint and forever changed ecosystems, the landscape and the climate–leaving the nonhuman life of the planet to respond and adapt, or perish. This is where the line begins to blur. Seeking to present both a catalog of living things, and to reflect upon the future of “natural” development in the Anthropocene Epoch, After Nature’s intent is to explore, in equal parts, traditions of “capturing nature” through means such as photography and still life painting, evaluate the current response of nature to humans, and consider what may yet be to come. Images—Top row, L–R: Lost Wax © Emily Budd; Stump VI © Marie Van Elder; Burmese Beetle © Molly Brown; Redemption © Win Normandi; Mother and Child Octopi © David Reisine. Bottom row, L–R: Conquerer's Gauntlet © Angelique Benicio; Midnight Flowers II © Stephanie Peek; Reconnoitering Confusion Hill © Tom Gehrig; Specimens (detail) © Joanna Kidd (top); Turbine Pass © Joeann Edmonds-Matthew (bottom). Don't Even F***ing Try It © 2017Serena Cole, watercolor, colored pencil, and flashe on paper, 20" x 16". Bay Area artist Serena Cole presents What It Feels Like For a Girl a body of work based on the appropriation and reconstruction of found imagery from fashion, art history, and current events. Cole's highly detailed mixed media artwork continues tropes from the history of painting such as the female figure and the still life. She uses these traditional formats as metaphors to examine what it feels like to be female living in America today. Uncanny, forward-facing and often distraught expressions of her portraits give autonomy to the figures who can see the viewer seeing them. Still life flowers continue reflections upon expectations of beauty and explore profound and inevitable failure as the flowers droop and fade. Cole considers each piece an avatar of herself, creating a uniquely personal exhibition of self-portraiture that invites reflection from the broader audience on female-hood in the current political climate. Color Emotion is an exhibition about the relationship of color to emotion; featuring artworks that primarily use color to evoke, express, or contemplate emotion or the narrative. Images: G. Cooper (left top); M. Sheft (left middle); M. Reis (left bottom); S. Jucker (2nd top); S. Freslon (2nd middle); Marc (2nd bottom); B. McLain (3rd top); E. Leo (3rd 1st middle); B. Schauble (3rd 2nd middle); J. Cooper (3rd bottom); C. Ostroff (4th top left); K. St. Clair (4th top right); T. Rudman-Young (4th middle); K. Crocetti (4th bottom); W. Wyss (right top); G. Heenan (right middle); K. Robinson (right bottom). The annual Small Works Exhibition is a wonderful opportunity to find affordable, quality artwork for the holiday gift-giving season. The submissions contain a diversity of mediums and subject matters. The artwork was selected based on the artists’ unique and modern approaches to subject matter, composition, color, and light. I enjoyed the range of submissions from three dimensional works, photography, and sculpture. While the definition of migration typically refers to the intentional movement from one place to another, we can point to this action being present in both our personal lives and on a global stage. Movements of individuals, communities, cultures and climate conditions have shaped history and continue to craft our current moment. Migration offers an exploration of this condition by the following artists. Images: Migration Dreams © Della Barnett, oil on canvas (top left); Canary Mine © Naomi Alessandra, watercolor, pen and ink, gouache (top middle); Coexisting © Susan Ryan, oil, (top right); Who are we? Where are we from? Where are we going? © Eric Kelly, mixed media on wooden panel, (middle left); Navy © Emil Yanos, ceramic (middle right); A Beautiful Wall is Still a Barrier © Sue Weil, handwoven tapestry (bottom left); Get In The Car Kids, It's Time To Go: IDPs, Refugees, Detainees, and Deportees © Lara Myers, installation: clothing rack and clothing (bottom middle); Search for Home © Ignacio Rojas, oil on panel (bottom right). Entaglement © Angelique Benicio, oil on wood,12" x 12"
Angelique Benicio’s work evokes the enchantment and eerie quality of Grimm’s fairy tales. The lush surfaces and realistic attention to detail in these oil paintings draw the viewer in, but there are unsettling undercurrents. Many paintings reveal an acute awareness of uneasy surroundings; others depict children facing difficult situations. Benicio understands that all of us have access to states of innocence and experience, regardless of age. The artist’s love of allegory is apparent in both her two dimensional and three dimensional works. Her paintings and installations invite the viewer to ask if there is something familiar gazing back, some long forgotten feeling, which, though difficult to define, is both unnerving and transformative. Images: After the Apple © Sanda Manuila (top left); Flow #6 (Cloudscape) © Stephen Kane (top 2nd); Soaring II © Rene Dayan-Whitehead (top 3rd); Velo © Mimi Makowsky (top right);The Spaces In Between © Georgia Gibbs (bottom left); Spatial Binary Five B © Nicholas Hullibarger (bottom 2nd); Flow: Seafoam © Alex Friedman (bottom 3rd); Lucci I © Tina Green (bottom right). Paper as Voice showcases artwork by 29 Bay Area artists using innovative techniques, concepts, and compositions to feature paper as the prominent "voice" of their work. Doubledroop © 2016 Nathan Lynch, burned cedar, 68" x 68" x 12"
To Round A Course Remnant © Em Meine, ink on paper, 6" x 8"
affordable, quality artwork for the holiday gift-giving season. Musical aims to showcase artwork relating to the art of music through subject matter, medium, or composition. Jurors: Donna Seager and Paul Liberatore: Donna Seager is the co-owner of Seager/Gray Gallery, Mill Valley California, seagergray.com. Paul Liberatore is a well-known writer who reviews music and pop culture for the Marin Independent Journal, his own blog page, paulliberatore.blogspot.com, and many other publications. Images: Mayor Mitch Polzak of the Royal Deuces © 2016 Dennis Hearne (left column top); Ponte Concerto © 2015 Jack Weaver (left column bottom); G Minor © 2014 Nancy Bardach (2nd column top); Adagio © 2016 Virginia Fauvre (2nd column middle); The Cellist © 2008 Bao Hoang (2nd & right column bottom); Blue Notes © 2016 Debbie Patrick (right column top); Yesterdays © 2016 Juline Beier (right column middle). Sky Chart © 2016 Raylene Gorum, vinyl and acrylic, 48"x48"
Phases is a contemplation on the various passages of time featuring a survey of recent work by Raylene Gorum. Using a variety of pattern sources such as topography, climate patterns, celestial movements, and Islamic tessellations; Gorum creates temporal works, which interact with the immediate space. The exhibition includes book publications; wearable concept art (mathy bling); a 40' long street-facing installation; map based works created in vinyl, acrylic, and mirrors; and a peek into her sketchbooks and process. Raylene Gorum is a Bay Area based artist who works primarily with intricately cut vinyl and tape to create installations and flat work that blur spatial boundaries through the use of reflective and transparent materials. She has a Bachelors of Architecture from Cal Poly San Luis Obispo and through the Ecole d'Architecture in Paris. She also studied Experimental Printmaking at Central St. Martins while living in London. Her works have been exhibited in San Francisco, New York, London, Milan, Hong Kong, Tokyo, Taipei, and Brazil and included in lots for auction at the Whitney Art Party and Phillips du Pury. Her largest installation to date occupied 165' x 16' of window across the street from MOMA NY on 53rd Street. She recently relocated to California and bought a houseboat in Sausalito after selling a popular singing bar, Baby Grand, that she designed, owned and operated in Soho, NYC. Marin Contemporaryshowcases Marin County artists who demonstrate unique and cutting edge applications of medium, composition, subject matter, and palette. The selections embody a diverse assortment of contemporary art that pertain to our modern day environment. Images: Lightshow © 2015 Cindy Ostroff (left column top); Pulled from the Fire © 2015 Stephanie Jucker (left column middle); Red Petal © 2016 Kate Zimmer (left column bottom); Adverse Reactions To Cymbalta Include: aeiou and sometimes y © 2015 Lara Myers (2nd column); Flag RWB © 2015 Stela Mandel (3rd column top); Atachafalaya © 2015 Brian Huber (3rd column middle); At Sea © 2016 Carol A. Levy (3rd column bottom); Urban Thoughts: Breaking In/Breaking Out © 2013 Richard Moquin (4th column top); Life's Complexities (San Anselmo creek) © 2013 Victoria Fernandez (4th column middle); Vino's Individuality II © 2015 Susan Searway-Fertig (4th column bottom); Circles © 2013 Enrique Goldenberg (right column top); Kellas.Diptych 2 © 2014 Betsy Kellas (right column bottom). Images: Saint Mary's - Abstract © 2015 Ryan Brignoni (left column top); Fortress © 2015 Sue Weil (left column middle); Abstract Digital Surface © 2016 Mahsa Vanaki (left column bottom); Escher Town © 2010 Suzanne Bean (center column top); Structures in a Floating World © 2016 Patricia Oji (center column middle); Pierce Ranch Triptych © 2015 Barbara Lawrence (center column bottom); Contrast © 2012 Debra Bibel (right column top); On My Way Home © 2014 Sandra McHenry (right column bottom). Like art, the practice of architecture deals with the balance of materials, decisions, and light to design form, function, and space. The artwork in this exhibition offer a dialogue about these dynamics as well as a variety of expressions, imaginations, and celebrations relating to architecture. Images: Salmon © A. Gaul Culley (left column top); King Tide at Crab Cove © 2013 Ron Rothbart (left column middle); Beth Terry © 2013 Tess Felix (left column bottom); Coywolf © 2014 Ellen Litwiller (2nd column top); Continuum © 2007 Lawrence LaBianca (2nd column middle); Canaries & Elephants 6–Oil & Ice © 2011 Vicki Gunter (2nd column bottom); Legacy © 2011 Constance Anderson (right column top); Byte-cycle © 2014 Angela Gonzalez (right column middle); Chulas Fronteras © 2015 Pamela Blotner and Elizabeth Addison (right column bottom). Climate Change exhibition aims to inspire stewardship of the planet by showcasing artists' visions of adaptation and responses to our changing environment. 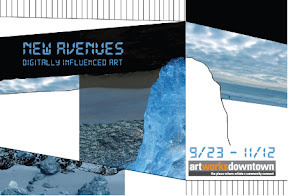 Art Works Downtown’s exhibition Climate Change brings a propitiously timed show to the San Rafael community. Artists depict the subject of climate change in a visual dialogue introducing viewers to the complexities that people, governments and societies face when envisioning Climate Change. Climate change within the Anthropocene epoch is based on human activities that generate anthropogenic, greenhouse gases, distinct from the greenhouse gases naturally present in the atmosphere. These emissions alter the atmosphere's composition, causing the “increased greenhouse effect that is leading to global warming.” The exhibition explores issues that led up to it and what it means to adapt to Climate Change. In December 12, 2015, 195 countries signed an historic global climate agreement in Paris, France. Artists instinctively captured the range of topics nations addressed at the UN Climate Change Conference in Paris, such as global warming, extinction, migration, mitigation, and adaptation. We experience in this diverse exhibition how artists are wrestling with and interpreting the vast array of complex climate change topics such as environmental ecosystems at risk, commentary on the political-economic players, and highly intrapersonal struggles humans experience. We see through these selected works the power of art to communicate on a truly visceral level. Artists approach these topics from many angles through work that is literal, abstract, expressive, or refined. Art Works Downtown offers a new platform for artists to lead the community in an exploration of the local, as well as the global, implications of climate change, providing potential for hope and peril. Through these selected works, we hope to inspire the audience to engage in discussion, both at the exhibition and in their daily lives, to educate themselves and be empowered to make a difference. Juror: JD Beltran is a conceptual artist, filmmaker, and writer whose artwork has screened and exhibited nationally and internationally receiving reviews in the New York Times, Art in America, ArtNews, and many other notable publications. She writes a blog column for SFGate.com, the online edition of the San Francisco Chronicle, and is faculty in the New Genres, Film, Interdisciplinary Studies, Critical Studies, and Urban Studies Programs at the San Francisco Art Institute. JD Beltran is also the President of the San Francisco Arts Commission. quality artwork for the holiday gift-giving season. For more information on the Cinema Snowglobe, see cinemasnowglobes.com. Technology has fundamentally changed how we experience the world. It mediates our sense of place, our identity, our relationships and communities. The artists in Technological Mediations use technology to discuss our mediated lives in the digital age. Jim Campbell's works are exhibited courtesy of the artist and Hosfelt Gallery. Craig Dorety's works are exhibited courtesy of Johansson Projects. Penny Olson's works are exhibited courtesy of Chandra Cerrito Contemporary. The Art of Rock Legends benefit exhibition features artwork by such iconic '60s musicians, artists, and photographers as Jerry Garcia, Carlos Santana, Janis Joplin, Dave Getz, Grace Slick, Marty Balin, Jimi Hendrix, Joan Baez, George Frayne (Commander Cody), Peter Max, Stanley Mouse, Graham Nash, Baron Wolman, and many others. The Art of Rock Legends is the opening event of San Rafael Rocks, a multi-faceted, multi-partner rock 'n' roll art, film, and music celebration with proceeds benefitting DrawBridge, a Bay Area arts program for homeless children, and California Film Institute Education, which provides creative film programs for Bay Area students. The Art of Rock Legends Preview Party, Friday, June 12 from 5-8pm, will be open to the public as part of Art Works Downtown 2nd Friday Art Walk. Note: Pricing for the events of San Rafael Rocks ranges from free (The Art of Rock Legends and San Rafael Rocks Block Party) to various ticket prices for events at the Smith Rafael Film Center and the Fenix musical tribute to Jerry Garcia and Merl Saunders, Sr. Painters Table with Unfinished Painting © 2015 Richard and Martha Shaw, ceramic, 37" x 20" x 15"
In the world of contemporary ceramics, Richard Shaw is the master of trompe l’oeil sculpture. He has developed an astonishing array of techniques, including perfectly cast porcelain objects and overglaze transfer decals. By combining the commonplace with the whimsical, the humorous with the mundane, Shaw captures the poetic and the surreal with the sensibility of a comedian. Art Works Downtown is honored to exhibit the work of master artist Richard Shaw. This special exhibit features collaborative works with painter Martha Shaw plus new work which has never been publicly exhibited. Thanks to Gallery Paule Anglim and B. Sakata Goro for their support of this exhibit. Defenestration Day © 2013 Jessica Hess, gouache on paper, 22" x 30"
Jessica Hess is a San Francisco–based artist whose focus lies primarily in photorealist painting. Hess's depictions of the urban landscape both celebrate and document the art of graffiti through a fine art lens of oil paintings on canvas and gouache paintings on paper. This career-spanning survey also includes hand-painted ceramics produced in conjunction with longtime collaborator Christa Assad. Richard Elliott is an Associate Professor and former Chair in the Textiles program at California College of the Arts in Oakland. Elliott has lectured, juried and curated several exhibitions and was a recipient of a California Arts Council Artist-in-Residency grant. His work is in private and corporate collections including the State Department of Health Services. 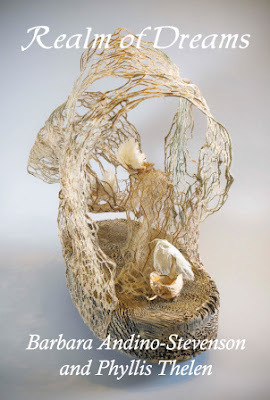 Images: Green Mountain © 2014 L. Susan Stark, silk dupioni and organza (top left); Cycle of Life © 2013 Susan Doyle, fiber (top right); Curves © 2013 Kelsey Leib, woven and knitted monofilament (bottom left); Reds © 2014 Chris Motley, knit wool, fulled and sewn (bottom middle-left); Urban Ephemeral © 2013 Emily Dvorin, oxygen tubing, acupuncture needle holders, cable ties (bottom middle-right); Scintillating Scotoma © 2012 Deborah Corsini, linen wedge weave (bottom right). Juror: Alan Bamberger is an art consultant, advisor, author, appraiser and principal of the website artbusiness.com. He has written three books and numerous articles about how the art world works, has photographed and reviewed thousands of art openings and events mainly in San Francisco and the Bay Area, and has consulted and advised numerous artists on all aspects of their art and careers. Cutting on the cutting edge of contemporary culture; squeezing ink where the waters of California squeeze between hills and mountains; cranking and pressing the images of this fleeting moment on the edge of the infinite sea. Bay Area printmakers make it their own way, but weave their work together in the brilliant light of this beautiful place and time.